An annual journal of the Thunder Bay Historical Museum Society. 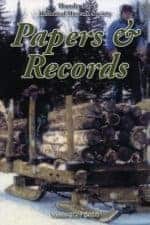 Papers & Records is a peer-reviewed journal issued annually by the Thunder Bay Historical Museum Society. It publishes new research and scholarship in both academic and publicly accessible formats on topics relating to all aspect of Northwestern Ontario’s diverse heritage. The journal also contains a “Records” section in which various archival collections are introduced to readers and a yearly “Recent Publications Relating to the History of Northern Ontario.” Submission guidelines are below. The original series of this journal ran from 1908 to 1928 under various titles, but was most often referred to as The Thunder Bay Historical Society Papers and Annual Reports. A special issue was published in 1967 to commemorate Canada’s Centennial, and the new series was begun in 1973, entitled Thunder Bay Historical Museum Society Papers & Records.